Paul W. Skinner, Ph.D., Soil Scientist, Terra Spase, Inc. The first comprehensive report on the weather of the Napa Valley and its influence on wine grape production (183 pages, 93 original color weather maps and images). 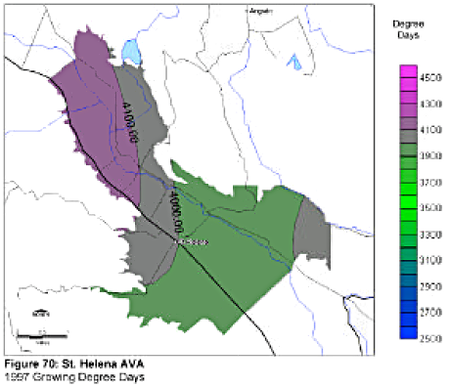 Weather and Wine Grapes in the Napa Valley AVA provides a detailed description of the 14 different appellations and the weather that has occurred within the Napa valley AVA from 1996-2002. Individual color maps of max and min temperature, precipitation, growing degree days, and disease risk are included for the entire Napa Valley AVA. Growing degree day maps for each appellation are also included. Weather and Wine Grapes in the Napa Valley AVA combines weather data on the growing, harvest, and dormant seasons with information on grapevine growth and production for the many different wine grape varietals grown in the Napa Valley. Understand vineyard site and varietal potential and vintage variations. Adjust vineyard production, irrigation, and pest management programs to achieve goals. Evaluate harvest scheduling plans and vineyard quality potential for wine grape pricing and purchasing agreements. Market wines produced from the unique terroirs of the Napa Valley AVA. A valuable resource for winemakers, vineyard owners, winery owners, vineyard managers, winery executives, winery marketing staff, and all other wine professionals. Call Terra Spase, Inc. at (707) 967-8325 x 13 or email terraspase@terraspase.com. The first comprehensive report on the soils of Napa Valley and their influence on wine grape production (233 pages, 137 original color soil maps and images). Soils and Wine Grapes in the Napa Valley AVA provides a detailed description of the 14 different appellations and the 33 different soil series that occur within the Napa Valley AVA. 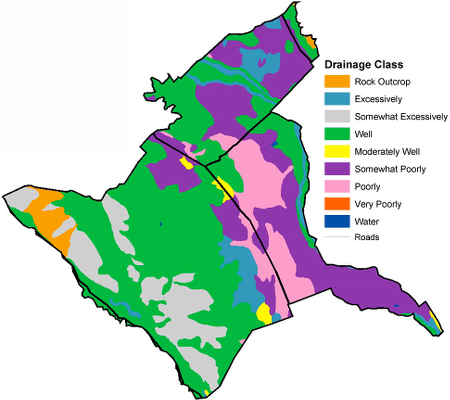 Individual color maps of soil series distribution, depth to bedrock, drainage class, base line fertility, and hydrologic groupings are included for each of the approved appellations in the Napa Valley AVA. Understand vineyard potential, irrigation requirements, rootstock performance, and vine growth and production limitations based on soil vigor potential, drainage class, vine nutrition, and soil profile characteristics of described soil series. Manage vineyard production and quality to achieve goals. Prioritize vineyard redevelopment and vineyard expansions projects. Plan vineyard site selection and analysis studies. Evaluate vineyard site quality potential for wine grape pricing and purchasing agreements.